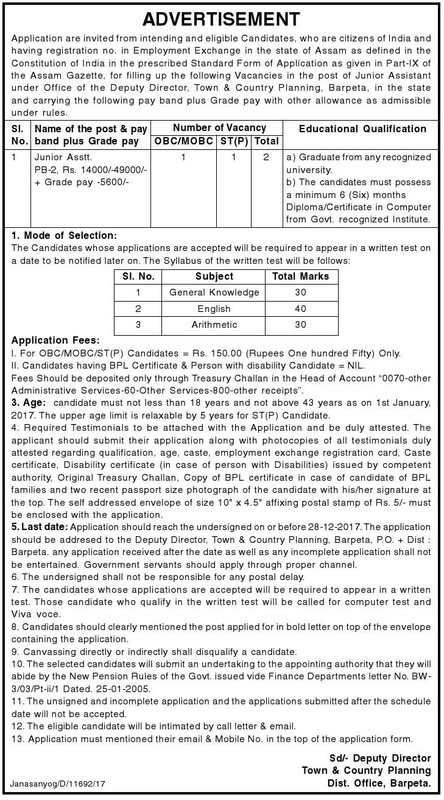 for filling up the following Vacancies in the post of Junior Assistant under Office of the Deputy Director, Town & Country Planning, Barpeta in the state and carrying the following pay band plus Grade pay with other allowances as admissible. b) The candidates must posses a minimum 6 (six) months Diploma/ Certificate in Computer from Govt. recognized Institute. Age: 18 to 43 years as on 1st January, 2017. The upper age limit is relaxable by 5 years for ST(P) Candidates. Mode of Selection: The candidates whose applications are accepted will be required to appear in a written test on a date to be notified later on. The syllabus of the written test will be follows. Application must mentioned their email & Mobile No. in the top to the application form.